A long-wave trough sitting over western Europe gradually moving NE, a new trough developing over Atlantic and approaching Iberia. Short wave trough crossing central Europe and will be focus for the main convective activity on Wednesday. A MDT risks has been issued for mountainous N Italy with threat for torrential rainfall. A MDT risk has been issued for parts of northern Mediterranean where maximized torrential rainfall threat will exist. Area will be closely monitored for a possible upgrade into HIGH risk on DAY 1 if conditions for another major flooding event improve. Some tornado threat seem possible along the coastal areas as well. A SLGT risk has been issued for areas surrounding the MDT risks with threat for heavy rain, strong winds and some tornado threat. 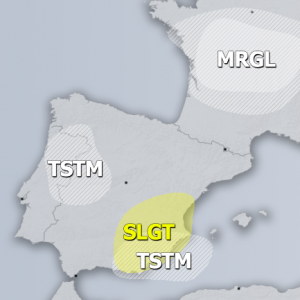 A SLGT risk has been issued for E France into Benelux and W Germany with threat for strong to severe wind gusts and tornadoes, given the favorable overlap of modest instability and shear. Some threat for marginal hail and heavy rain exists as well. 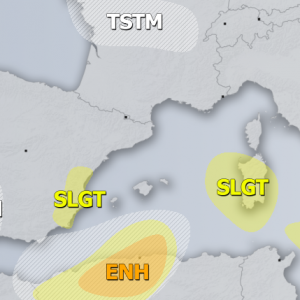 A SLGT risk has been issued for extreme W Iberia mainly with threat for heavy excessive rain and severe winds.